The Infamous “Error updating a list item” Error Message on a SharePoint Designer Workflow | Are you a user? I can’t tell you how many times I’ve seen this error message while creating SPD workflows. Many times it is a permissions problem, as the workflow is generally running under the context of the credentials of the person who initiated it (at least in 2007). Since the limitation exists in SPD 2007 workflows to not easily change the security context of the running workflow, I usually tighten the security around the lists and libraries I use to insure those participating in the business process workflows only have the security needed to function in their assigned role. It turns out that that is too long! 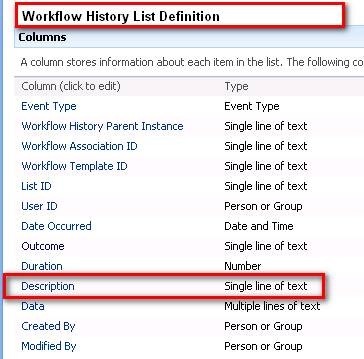 If you look at the Description field on the Workflow History List you can see that it is defined as a single line of text, i.e. it can accept no more than 255 characters. My log message exceeded this limit. If you haven’t looked at the Workflow History List in SharePoint through the browser, you can use SPD to enable it so it shows on the "View all site content" page. You can find it under the LIsts folder and select the properties sheet and uncheck the "Hide from browser" checkbox.